turquoise to sky blue [depending on the weather and cloud cover]." Wow! I can see why the surrounding area is one of the most popular places in Utah to visit or live. It's not as spectacular as Lake Tahoe but it's a whole lot less crowded and unpretentious. This is a much more peaceful place to play, relax, and enjoy nature. Today's 221-mile trek took us through beautiful canyons and lush valleys with continual mountain views in three states: Utah, Idaho, and Wyoming. 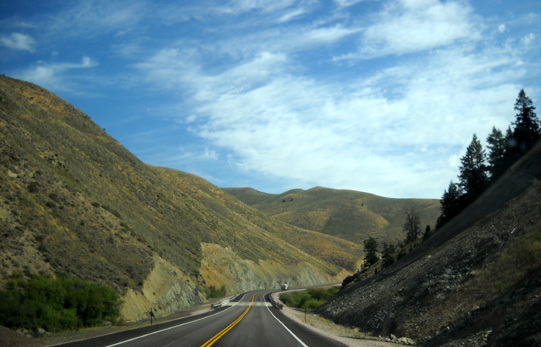 The weather was great for a leisurely drive, although a bit hazy through Logan Canyon. 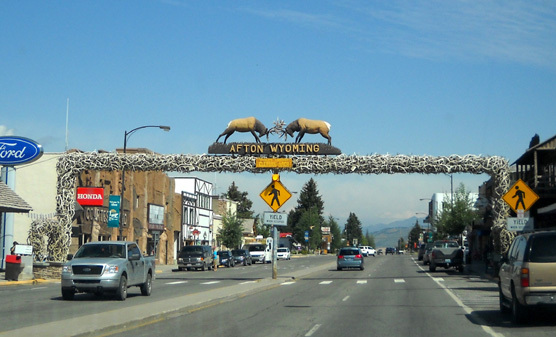 Photos came out more clearly by the time we reached Wyoming. Most of the trip was above 6,000 feet; even at moderately high elevations, it was quite warm. 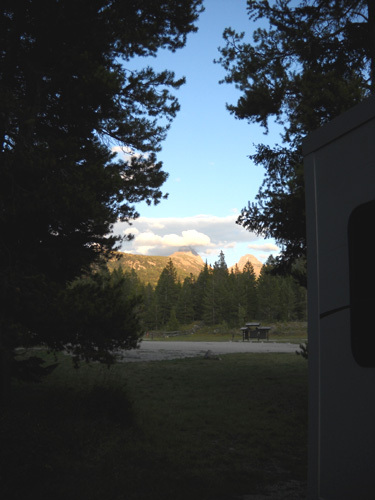 With several stops it took us about five hours to reach our destination, the Reunion Flats Campground in Teton Canyon on the western slopes of the Grand Teton Range. There was no reason to hurry nor any safe way of going fast hauling a 5th-wheel camper in mountainous terrain and through several little towns. The roads were all good, just winding and hilly in places. You'll appreciate this route more if you don't rush through it. 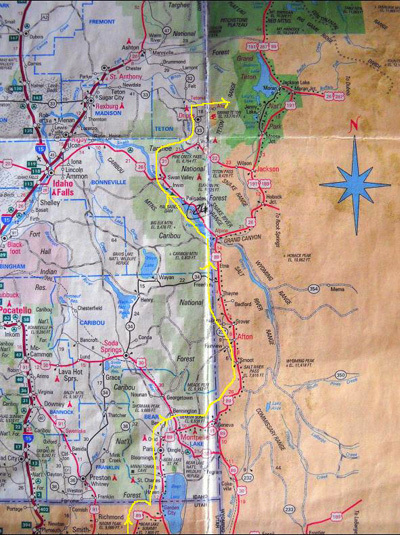 I marked our route in yellow on the map segment below, just to the left of the roads we took. I'll describe it in more detail below. The brown rectangle at the bottom left is the NE corner of Utah. Wyoming is the right half of the map segment, Idaho the left. This view is from the Idaho AAA map so that half is more detailed. Grand Teton NP is right of the top arrow; Yellowstone NP is above it. This morning we started at Sam's Club in Logan, UT (farther south than shown on the map segment above) and wound our way up through Logan Canyon on the national scenic byway (US 89). We passed the campground where we spent our first five nights in the canyon, Temple Fork Road where we started two hikes/runs on the Bear course, and the turnoff for Tony Grove Lake, the farthest we'd gone up the canyon previously. Then the real fun started because the next hundred miles were new to us. We both love exploring new ground, whether by foot or on wheels. 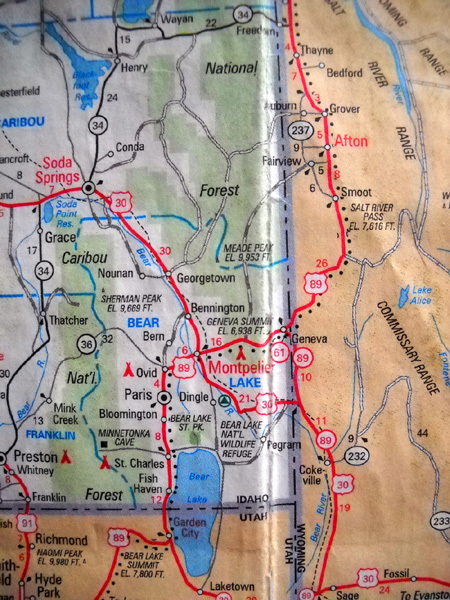 Most of the route is designated "scenic" on our AAA maps with little red dots along the highways. You can see the dots on the map above. The roads that don't have dots, should have. It was very pretty the entire way. For those who are interested in the travel part of this journal, here's our route and some of the things you'll see along the way. I encourage readers to drive all or part of this route when you're in the area -- or make it your destination. 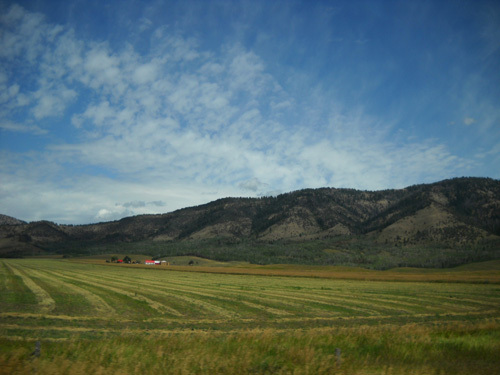 It's gorgeous country! I've been curious about all the sights in the upper 20+ miles of Logan Canyon that we hadn't seen until today. If you go to this link and click on "31 Sites & Stops," you can read more about the section of the byway between Tony Grove Lake and Bear Lake. There's the rugged 45,000-acre Mt. 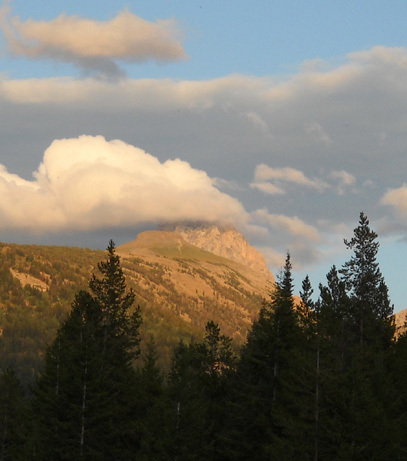 Naomi Wilderness Area with some great trails for running, hiking, and horseback riding up to nearly 10,000 feet in elevation. Some of these trails are on the Bear 100 course; Jim will check more of them out when we return next week. 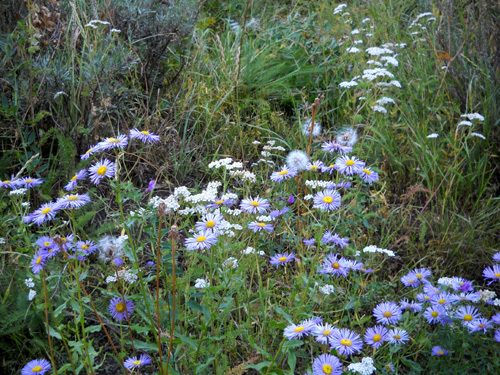 This area is known for its gorgeous wildflowers and extensive wildlife viewing. Although we skirted Franklin Basin on the byway, the best way to see this popular year-round recreation area is to turn off the main road and either drive its less-traveled roadways or run/hike/ride its trails. The Bear 100 still goes through Franklin Basin. This is also a popular area for fishing and snowmobiling. Next comes the Sinks area (named for its numerous sinkholes), another basin that is popular with skiers and snowmobilers in the winter. This area used to be filled with mines in the 1870s. They produced mostly galena, a conglomerate which contains lead, gold, silver, and copper. Near the summit of Logan Canyon, elevation 7,800 feet, are the popular Limber Pine Nature Trail and the Sunrise Campground. We are tempted to spend a few nights here when we return. It's a very pretty campground with lots of aspen trees and some views of Bear Lake. There are a few sites large enough for our camper. It's also convenient to the last miles of the Bear course. 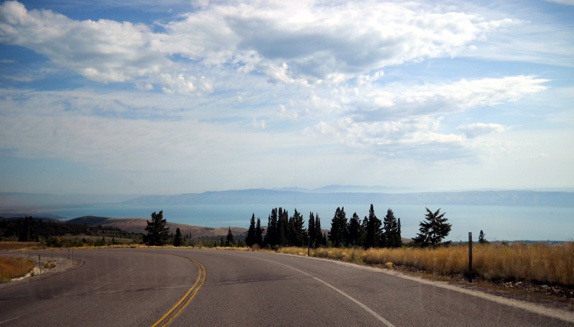 The crown jewel at the summit of the canyon is the Bear Lake Overlook and Rest Area. The parking area is big enough for many cars and RVs, so we pulled in and took a long enough stroll to see the large lake from several angles (next two photos) and to read the interpretive signs. Not much contrast between sky, distant mountains, and water on this hazy day. 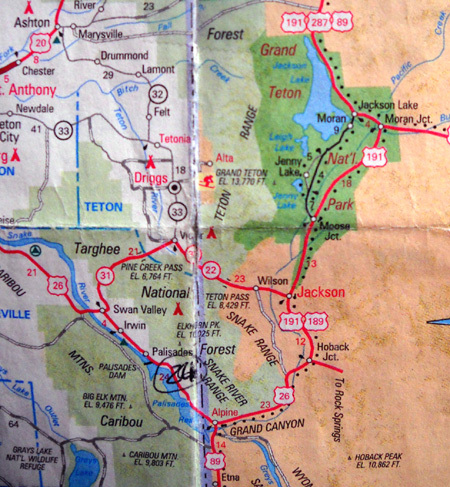 As you can see from the next map, the northern half of the deep, twenty-mile long lake lies in Utah, the southern half in Idaho. The lake is eight miles wide. I loved the 1,800-foot drop down a long, scenic series of switchbacks on Hwy. 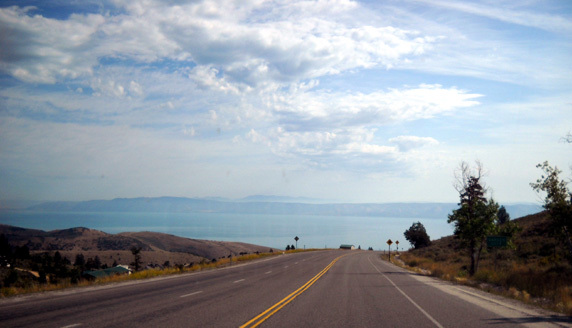 89 to the town of Garden City, UT, which sits on the western side of Bear Lake. If I wasn't an accident waiting for a place to happen, that would be a blast to cycle! 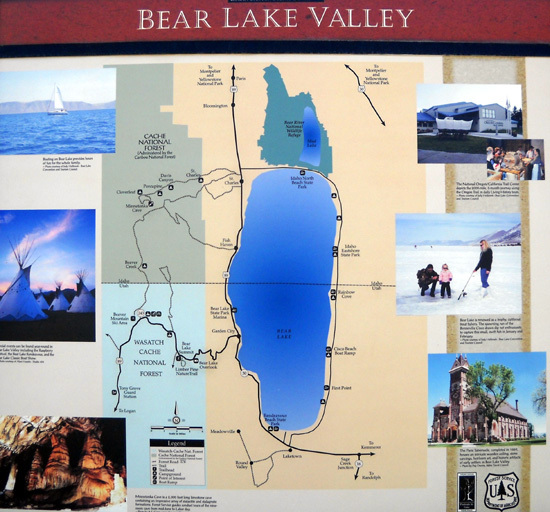 The history of the area around Bear Lake is interesting, beginning with the Ute, Shoshone, and Bannock Native American tribes who hunted and fished there for many generations before white men "discovered" it. According to the guide referenced above, during the 1820s mountain men who came to trap and trade in the Rockies gathered at Bear Lake for some of their annual trading fairs or rendezvous. 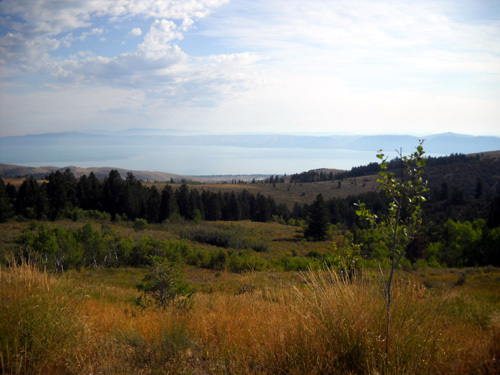 Mormon pioneers established permanent settlements around Bear Lake in the mid-1800s. 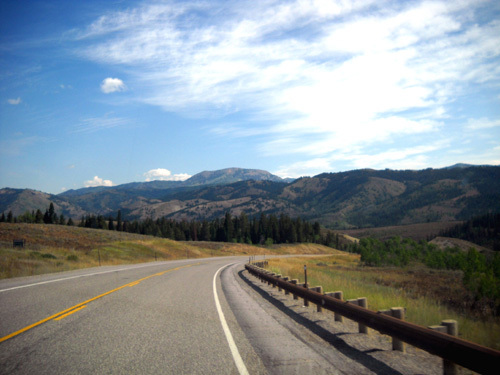 Descending the scenic byway to Garden City and Bear Lake. 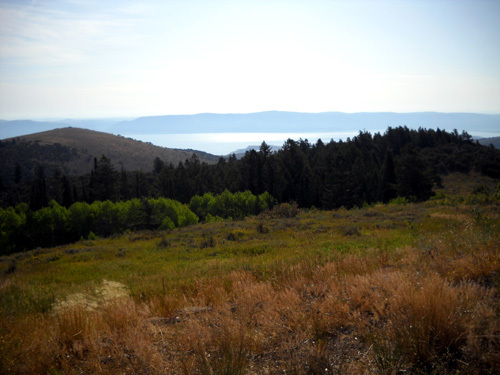 Bear Lake Valley has two main draws for residents and visitors alike: its fertile agricultural lands and its recreational opportunities. The area is best known for its succulent raspberries. Although we saw lots of signs to that effect, we didn't see any place open this morning to get a raspberry shake. The lake itself draws numerous visitors, especially in the summer when they can swim, water ski, sail, and fish. 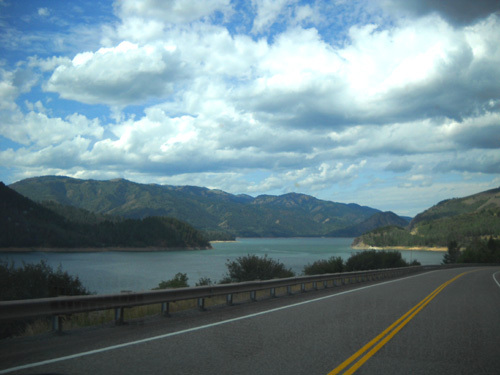 There are at least three state parks around the lake in Utah and Idaho where families can camp and access the water. 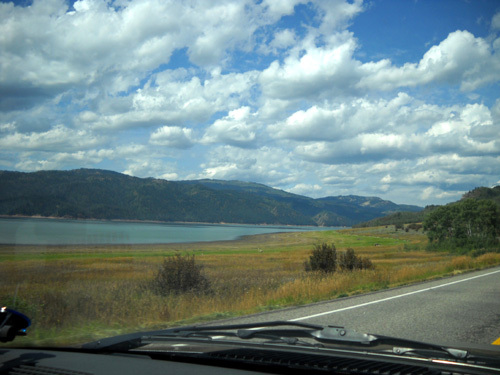 We could see several marinas and sandy beaches as we followed US 89 along the western side of the lake. If you like to fish, you might be interested to know that there are four fish that live in Bear Lake and nowhere else in the world: the Bonneville Whitefish, Bear Lake Whitefish, Bear Lake Sculpin, and Bonneville Cisco. Because the lake has been geographically isolated for at least 100,000 years, these species have evolved to its unique water chemistry, described in the opening quote to this entry. Anglers not only fish for them in warm weather, they also ice fish in the winter and early spring when the fish are spawning and come up closer to the surface (the lake is 200+ feet deep). Fertile farms on the approach to Garden City. We were hoping to find the last bit of the Bear course and see where the race finishes in Fish Haven, ID, just across the state border a few miles north of Garden City. We saw a couple of likely places but couldn't determine if either was correct. We'll have to consult the GPS waypoints and look at the course description more thoroughly before we come back so Jim can run that part. 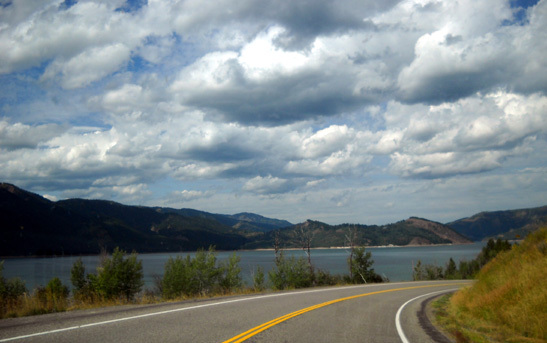 I noted that US 89 becomes the Bear Lake Scenic Byway (not national scenic byway) in Idaho. It does indeed continue to be scenic with the lake to the east, many attractive farms and ranches through the valley, and mountains in the Caribou National Forest to the west. What a pleasant place to live or visit! We continued to follow Hwy. 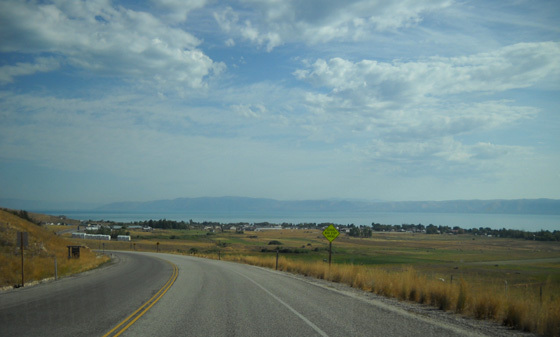 89 north and east around Bear Lake in Idaho, crossing into Wyoming shortly after the Geneva Summit. No joke! It's also shortly past the town of Paris, as you can see in the AAA map segment below. 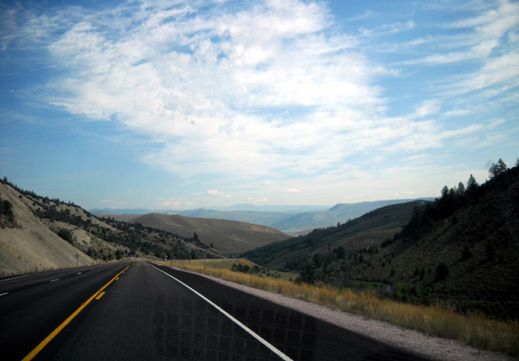 The scenic road then heads mostly north and somewhat parallels the border between Wyoming and Idaho for about 67 miles until it comes to a junction at the Grand Canyon: again, no joke; this canyon is in Wyoming, not Arizona. By mid-morning the haze had worn off and we had bright blue skies. 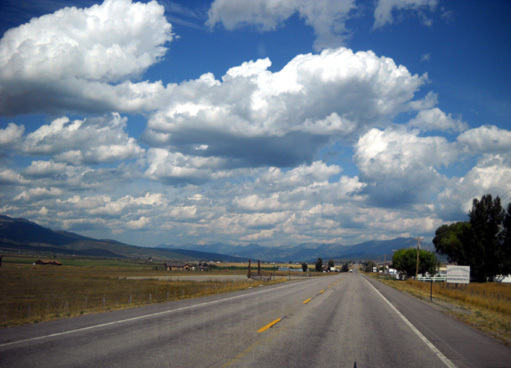 As we traveled farther north and closer to the Tetons the clouds increased. High mountain ranges have their own micro-climates. Like the last four photos above, the next set is from what I jokingly refer to as "The Windshield Series." I literally take the shots out the windshield as Jim is driving! He doesn't like to stop very often for me to take photos and I don't want to miss some great views as we travel. This is our compromise. With newer digital cameras that have image stabilization, some of the landscape shots I take in this manner are as good as ones I take the normal way. They often have a vent reflection in the windshield, however. There are various diversions along this road besides the great scenery. 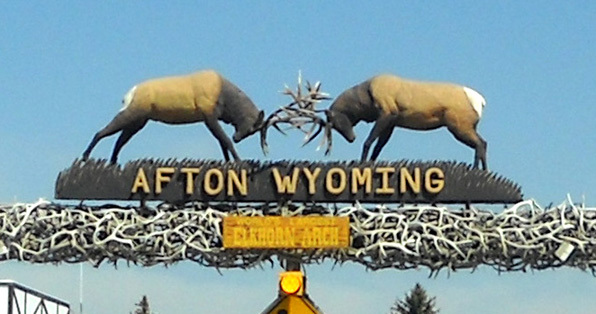 For example, there's the "world's largest elk horn arch" which stretches across the street in Afton . . . Above and below: the arch is made of antlers tightly stacked together. I can't vouch for the accuracy of their claim, but I can say that one of the great pleasures of travel off the interstate system is seeing these snippets of Americana. And I actually like this better than the world's largest peanut statue or biggest ball of twine! A little farther north in the town of Thayne we stopped at a Maverick station for diesel ($2.65/gallon) and dumped our gray and black water for free. We never did find a dump in Logan Canyon or city. We also ate lunch in the camper while we were stopped. We usually don't eat any meals out when we're in transit. Here are a few more photos on the way to Alpine and the Grand Canyon (sorry, no shots of Wyoming's Grand Canyon from this trip; we headed the other direction). 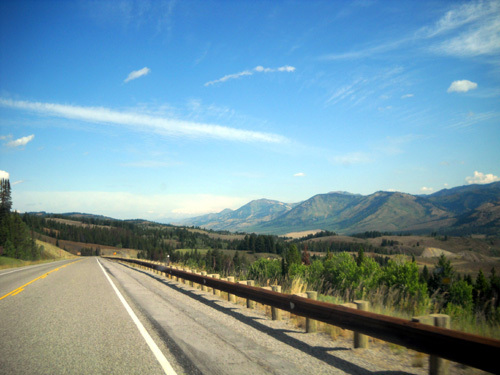 At Alpine, WY we headed west on a scenic 28-mile section of Hwy, 26 along the Snake River and Palisades Reservoir to Swan Valley, ID. Today we stayed at lower elevations (~6,000+ feet) as we followed the river, circling clockwise around the south and west sides of the big loop around the Snake River Range. You can see the loop clearly on the map above. Although the road is only two lanes, it is wide and in great shape, with enough straight stretches for faster traffic to pass slower vehicles. We drove this section eastbound two years ago, but this was our first time going west and it seemed like a whole new route to us. 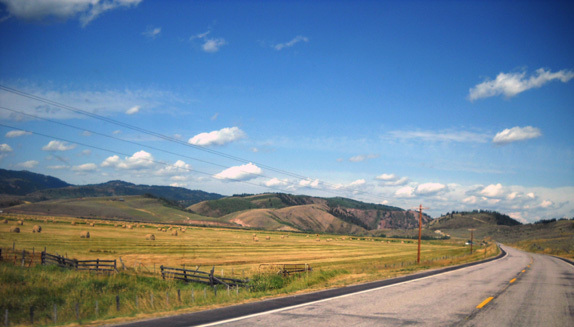 It's odd to me that AAA doesn't designate either US 26 or 31 as "scenic" on its Idaho map. If this isn't scenic, I don't know what is. 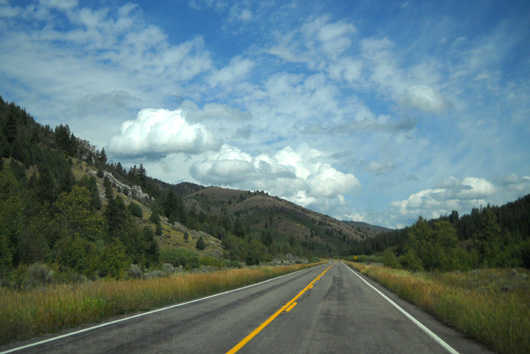 There is a pass on this segment of US 31 (Pine Creek Pass) but there isn't nearly as much elevation change from Swan Valley as approaching the 8,429-foot Teton Pass from Jackson Hole. 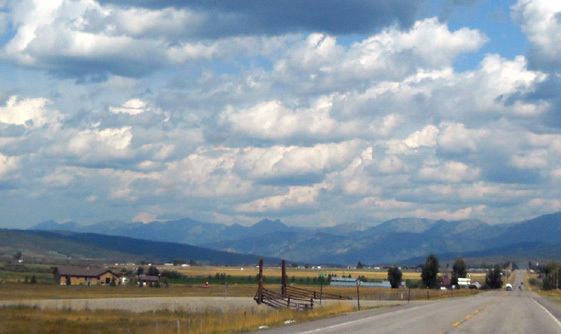 In Victor we turned left on US 33 and drove north to the town of Driggs through a broad valley with the foothills of the Teton Range to our right and occasional glimpses of the 12,000-13,000-footers in the background. We were on more familiar turf now, and almost to our destination. We arrived in Driggs, ID about 2 PM. We had enough supplies that we didn't need to shop at the large grocery store, but we did need to check our e-mail before heading up the road another twelve miles to the campground. We learned that drill when we were here two years ago; there is no Verizon cell service at Reunion Flats Campground or at Grand Targhee Ski Resort, where Jim will be running a race on Saturday. I watched my phone as Jim drove up Ski Hill Road to Alta, just inside the Wyoming border. By the time we turned on Forest Road 009 into Teton Canyon, we had no signal at all. We were hoping it might have improved since we were here before. We did find one sweet spot about a mile from our campground on the forest service road, however, right where the race course turns onto the dirt road for half a mile. One bar means we might be able to make calls from there, but it's not reliable enough to get on-line. 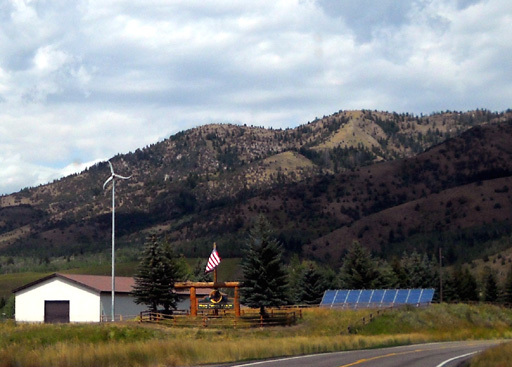 Reunion Flats is one of three National Forest Service campgrounds in Teton Canyon where visitors have electrical hookups, clean restrooms, and access to water spigots (no dump). Reunion Flats is the fist one you come to, just under three miles into the canyon. 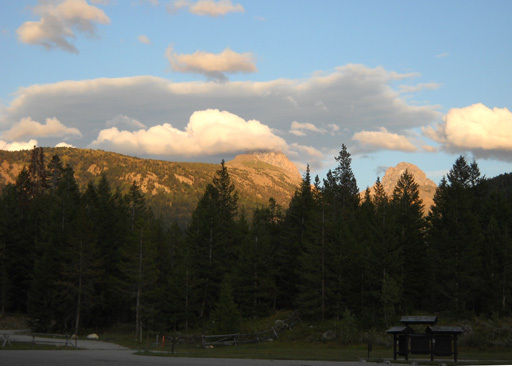 The other campgrounds are two miles farther, at the end of the road near several foot and equestrian trailheads into the western side of the Teton Range. We reserved the same site we had two years ago when Jim first ran the Grand Teton Race. 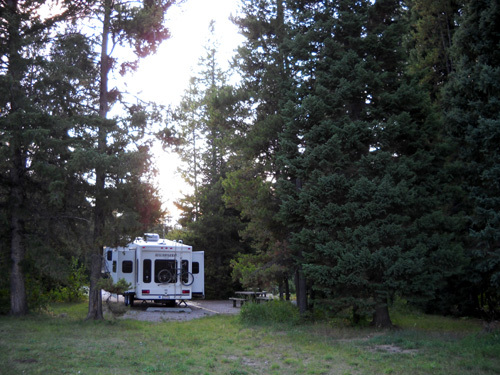 There are also several isolated dispersed camping (AKA boondocking) sites along the road where campers can stay for free. We prefer to stay at Reunion Flats because the campsites are spacious, adjacent to beautiful woods and two creeks, close to water spigots we can reach with two or three hoses, and only $10 a night. The paid campgrounds are also fenced to keep the free-range cattle out. So far, we're the only ones here besides the campground hosts. 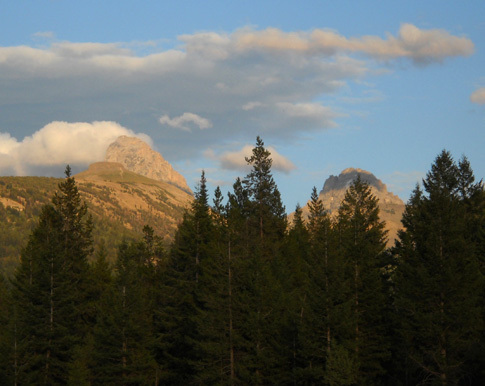 The peak on the left is Grand Teton, elev. 13,770 feet. 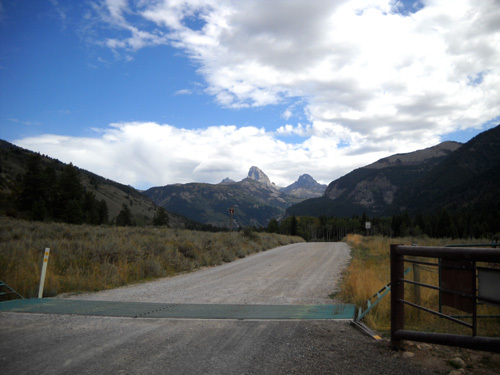 The one on the right is Middle Teton (12,798 feet). Anyone staying in the campground can get the same view from the entrance parking area. Now I can't wait to get out there and see them closer up on the trails!